Giants +5 1/2 over the RAMS- The Giants have been coming together as a team on the both sides of the ball. Odell Beckham Jr. leads all rookies in receiving yards (972) and touchdown catches (9). Eli Manning, thanks in part to Beckham, has shown signs of the Manning of old. 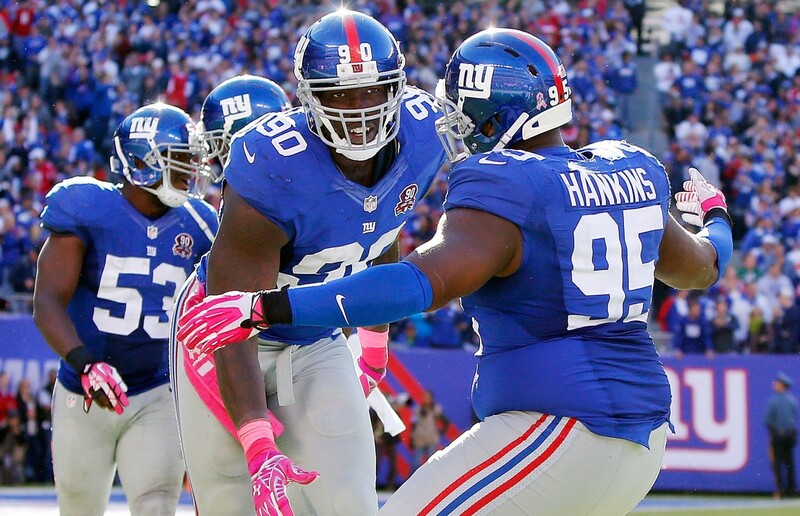 Jason Pierre-Paul has six sacks in the past three games while Johnathan Hankings has collected 3.5. Rams are a huge step up in class from who the N.Y. football Giants have been facing of late, but they seem to be rallying around their beleaguered but much beloved coach, Tom Coughlin, second among active head coaches in career wins with 163. STEELERS -3 over the Chiefs- A little inconsistent at times this season, (remember their stunning loss to the Jets), the Steelers will need to stack the box this Sunday and contain Jamaal Charles and Kansas City’s prolific running game which, without scoring by their wide receivers this season is the Chiefs only real offensive threat. Blitzes and stunts thrown at QB Alex Smith on passing downs will help in that effort as well. We like the black & gold at home even giving up the three points. Ravens -5 over the TEXANS- With the loss of QB Ryan Fitzpatrick, Houston is down to Case Keenum or Thad Lewis as his backups. Neither, however will frighten the staunch Raven’s defense. The Texans have won, and handily, against some of the worst teams in the NFL this season. Teams such as the Raiders, Jaguars, Redskins and the Titans (twice). Baltimore, among the better teams they’ll face in the league, needs this game desperately and should win this one going away. Ravens DST should amass some nice fantasy points for those still in the fantasy playoffs this week. Broncos -3 over the BENGALS- Denver, losers of only three games all season, are still playing for possible homefield advantage throughout the AFC playoffs should New England falter during their last two games. New Broncos weapon- running back C.J. Anderson along with the absence of Bengals LB Vontaze Burfict, make this a little easier for Peyton to pick up his 12th win of the season. For many teams this week will mark the halfway point in the regular season already. How fast did THAT go? Interesting weekend of football coming up; We’ve got another rookie quaterback starting, this one is Zach Mettenberger of the Titans, then there’s a 9:30 a.m. televised game from London featuring the Lions vs the Dolphins, concluding with the Cowboys and Indians (Redskins actually) on MNF. CHIEFS -7 over the Rams- The Rams did an outstanding job of upsetting the Seahawks last week but now it’s back to reality in probably the league’s second most loudest stadium. In their only home game this season, Kansas City destroyed New England 41-14. They will have no mercy on St. Louis on Sunday. JAGUARS +6 over the Dolphins- Jags quarterback Blake Bortles has been coming on and led the Jaguars to an impressive 24-6 stunning win over the Browns in Week 7. Jacksonville’s defensive line has quietly amassed the second most sacks in the NFL (22). We’ll take the six points against a middle-of-the-road team like the Fish. Texans -3 over the TITANS- Neither team will blow anyone away but we’ll take seasoned veteran gunslinger and “Bearded Wonder” Ryan Fitzpatrick over rookie Zach Mettenberger any day of the week, especially Sunday. Jadevon Clowney and J.J. Watt on defense and RB Arian Foster the team’s main offensive threat, make this an even easier decision. 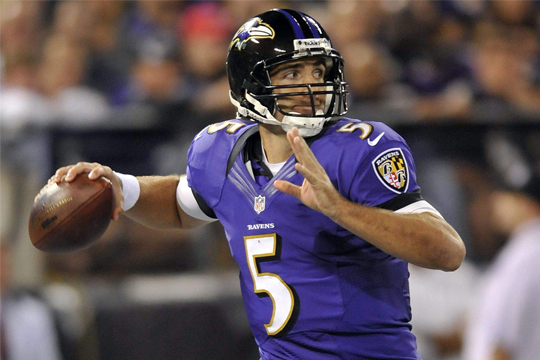 Ravens -1 over the BENGALS- Baltimore and Joe Flacco have been playing on all cylinders while the ‘Bungles’, ever since the loss of all pro wide receiver A.J. Green went down with an injury, haven’t returned to their winning ways. The Ravens, known for their “D”, have only yielded 14.8 points per game this season and should take care of a Bengals team that not only couldn’t beat Carolina, but gave up 37 points in that game to the ‘Cats. Colts -3 over the STEELERS- Short week for the Steelers who played on Monday and enjoyed a big win. Although on paper this sounds like a highly competitive game, the loss of Trent Richardson and possibly Reggie Wayne won’t help Indianapolis but Andrew Luck just continues to find ways to win with his favorite receiver T.Y. Hilton. This season will long be remembered for the “year of the back up” especially at the quarterback position. Because of the nature of the physicality at running back, every year is a year for back ups! Here are this week’s Waiver Wire Pickups; none of which are owned in more than 28% of leagues as of Tuesday, Nov. 12, 2013. We’re getting close to playoff time in fantasy, so tweak now before the season is over. 1. 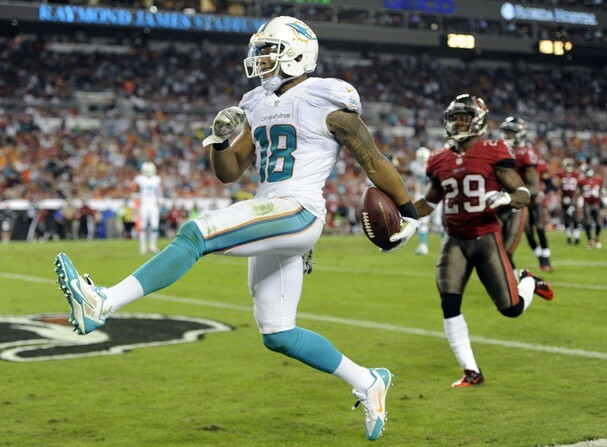 Rishard Matthews-WR-Dolphins- 5% Owned- Miami faces a Chargers team this week that gives up the 7th most fantasy points to wide receivers. Matthews had 11 receptions last Sunday, good for 120 yards and two touchdowns and has become QB Ryan Tannehill’s favorite receiver. 2. Carson Palmer-QB-Cardinals- 28% Owned- Over the last two weeks, Palmer has thrown for 413 yards, with 4 touchdowns and only two interceptions. His quarterback rating over those games is 104.1. The Cardinals will go up against the lowly Jaguars this week, who have given up the 4th most fantasy points to QBs this season. 3. Brian Leonard-RB-Bucs- 7% Owned- After Mike James went down early in the first quarter on Monday Night, Leonard came in and had 22 touches. His O-line didn’t open up too many holes for the veteran ex-Ram back, but he’ll get the bulk of the carries again this Sunday. Use him as a Flex play and as a RB3 until he shows a jump in his productivity. 4. Ryan Fitzpatrick-QB-Titans- 2% Owned- With Jake Locker (foot) getting injured in last week’s game (and out for the remainder of the season), Fitzpatrick came off the bench and orchestrated two touchdown drives including one rushing touchdown of his own. His problem is, and has always been, turnovers. Use him in two QB leagues or very deep leagues only. 5. 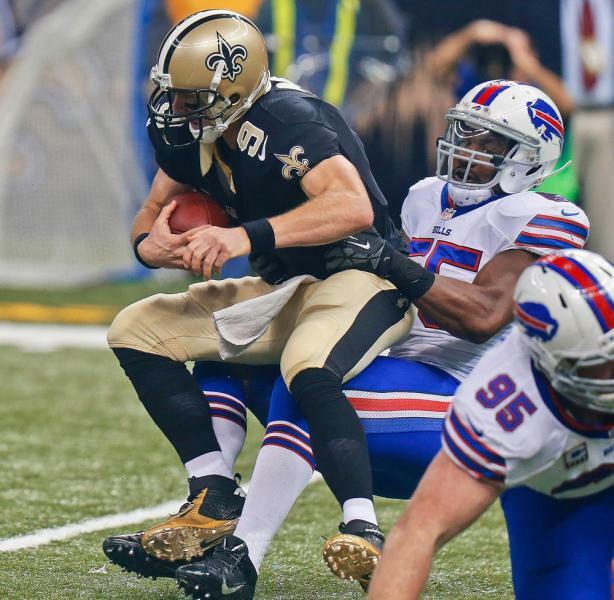 Bills-DST- 23% Owned- Very quietly, the Bills have put together some serviceable numbers on defense. They are tied for the most interceptions (13) in the league and have the 2nd most sacks (33) just three behind the first-place K.C. Chiefs. They are home this week against the Jets who have a quarterback (Geno Smith) who has been sacked 30 times this season and has thrown 13 picks (2 against the Bills back on Sept. 22). 6. John Carlson-TE-Vikings- 2% Owned- With the Vikings number one starting TE Kyle Rudolph out for 4-6 weeks, Carlson had a team high seven receptions last week for 98 yards and two touchdowns. We don’t think he will do that every Sunday going forward, but if you are in need of a TE2, we do recommend Carlson.